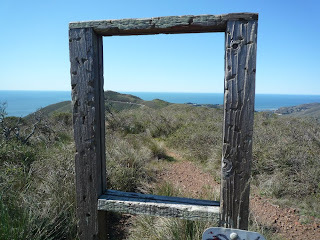 I only had time for a short Marin Headlands hike yesterday, and I found a destination that packs a whole lot into just 0.8 mile -- Slacker Hill! The small trailhead sits at the junction of Conzelman and McCullough. I followed a path to the north, crossed McCullough, and begin climbing on the wide signed trail. 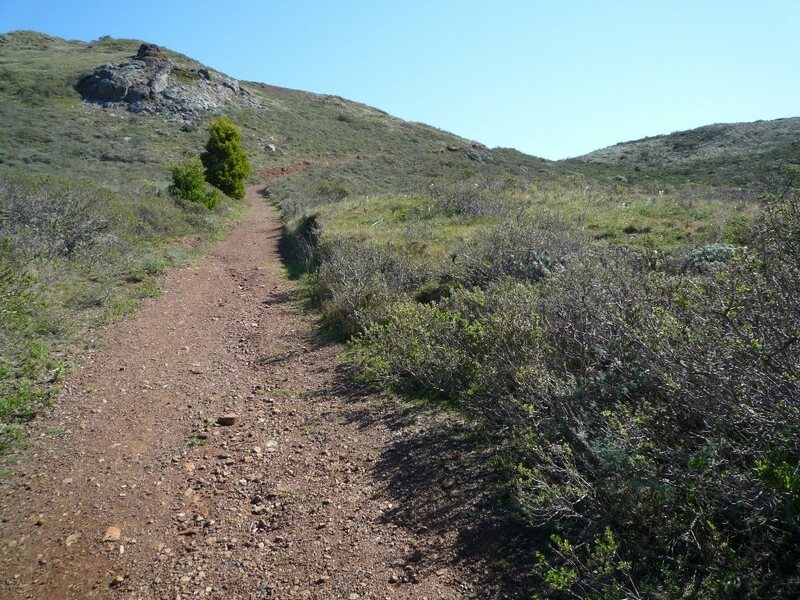 The grade is moderately steep throughout as the rocky trail climbs through nearly treeless coastal scrub, with sagebrush and coyote brush common. I saw quite a bit of zigadene in bloom, as well as some purple bush lupine, California poppies, ookow, paintbrush, and checkerbloom. At 0.2 mile, Coastal Trail heads off toward the Golden Gate Bridge, and the dead-end trail to the viewpoint sweeps right. More climbing. Views back to the north are incredible and include all the Headlands hills and Mount Tamalpais. A pipevine swallowtail fluttered along. Near the top the trail splits once more, but the path to the left was signed as closed. The last bit to the top was somewhat overgrown and I was surprised to see native bunch grasses here. The very top is wide open and level and offers simply the best views of the Headlands, Golden Gate Bridge, ocean, San Francisco, and just about everything else for miles and miles. The best part? I had the hilltop completely to myself. I saw some interesting photos from 'Slacker Hill' and did some research - I've been going to the Headlands for years, and didn't know Slacker Hill. Went exploring two weeks ago, and it was a huffer for me, but the occasional pauses were worth it - the views are great in all directions. My experience was the same as yours, Jane - I had the place to myself! BIG fan - thanks for the post! Love it up there. I've spent many hours doing habitat restoration for the park service in that area. The empty frame in your photo was probably a sign about the mission blue butterfly & respecting the habitat. GGNRA is a little sign happy if you ask me. Makes an interesting viewfinder this way. Jane - I am trying to reach you by email about a photo request - sent my email to feedback5 at bahiker dot com? Is this correct? Can you email me at ahutzel at scc dot ca dot gov if there is a better address to use? Hi – Will you please post a link to your Blog at The Hiking Community? Our members will love it. It's easy just cut and paste the link and it automatically links back to your website… it’s a win win. You can also add Photos, Videos and join or start Hiking discussions if you like.